Global Intumescent Coatings Market size is forecast to surpass USD 1.2 billion by 2024 owing to its applications in automotive, oil & gas, and construction sectors primarily due to its fire-retardant properties. They provide fire protection due to swelling properties at high temperature and are applied to structural elements like wood, steel, and aluminum structures which usually lose strength during fire. Growing use of passive fire protection methods as per structural design codes are predicted to promote the industry growth in the coming years. 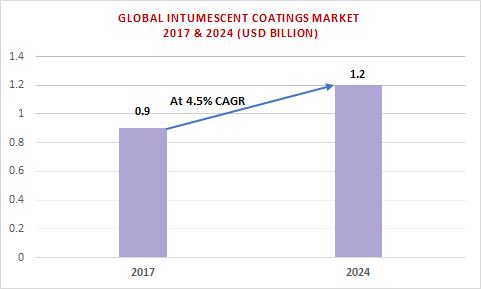 Intumescent coatings industry size worth over USD 900 million in 2017, is projected to surpass USD 1.2 billion by 2024, growing at a CAGR of around 4.5% over the period of 2018-2024. Its growing use in oil & gas, construction, and automotive sectors is predicted to boost the market growth trends over the coming eight years. 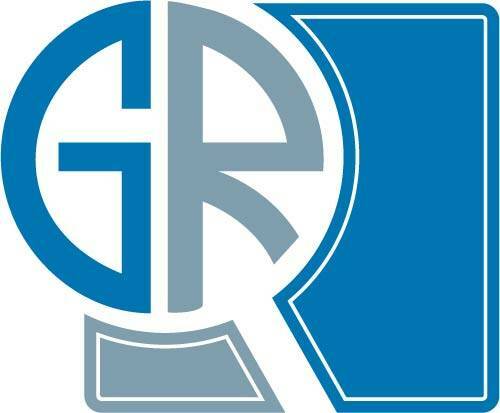 However, scarce supply of raw materials like graphite, epoxy resins, and sodium silicate, largely used in construction and automotive industries, is predicted to inhibit the market growth. Intumescent coatings market is segmented in the terms of applications, technology, end-use industries, and regions. Cellulosic applications segment worth over USD 430 million in 2017, is anticipated to witness a noticeable growth over the forecast period. Rising health & safety concerns coupled with heavy demand for intumescent coatings from construction and automotive sectors is predicted to drive the segment growth. Hydrocarbon applications segment worth over USD 450 million in 2017, is projected to make significant gains at over 5% over the period of 2018-2024. Key explorations in oil & gas and energy sectors have resulted in heavy demand for the intumescent coatings in these sectors. Water based intumescent coatings market is predicted to grow at over 5% over the period of 2018-2024 owing to its weatherability and low volatile organic compounds (VoC) contents coupled with its ecofriendly features resulting in safe workplace conditions. Solvent based intumescent coatings market is anticipated to witness moderate growth over the forecast timeline due to its high dry rate, resulting in damage of the soft coated surface layer. Construction end use segment is expected to witness a substantial growth over the period of 2018-2024 owing to the growing demand for intumescent coatings in buildings & constructions as a result of its fire retarding (or fire resisting) properties. Oil & gas end-use segment worth over USD 450 million in 2017, is predicted to witness significant growth over the forecast timeframe owing to extensive use of intumescent coatings to provide protection against fire to steel structures used in offshore oil & gas applications. Germany intumescent coatings market is predicted to grow at a CAGR of around 4.5% over the period of 2018-2024 owing to strict rules regarding vehicle safety and protection against fire. Brazil intumescent coatings market is predicted to register highest gains at around 5% over the period of 2018-2024 owing to strict legislations passed by the government regarding the use of fire protection systems in constructions for safety purpose. The U.S. market is projected to witness a surge over the forecast timeline owing to the growing application of intumescent coatings in the aerospace sector to protect various airplane parts from fire. China intumescent coatings market worth over USD 145 million in 2017, is predicted to witness a substantial growth by 2024 as a result of rise in infrastructure spending and the presence of high amount of shale gas reserves in the region. Key industry participants include AkzoNobel, Crown Paints, Carboline Global, Rudolf Hensel GmbH, Sherwin-Williams, and Hempel Group.